'Sitcom King' Chuck Lorre On 'The Kominsky Method' Chuck Lorre's new show for Netflix stars Michael Douglas and Alan Arkin as an aging star and his longtime agent. It's set in Hollywood, but it's really about the biggest show of all: growing old. Michael Douglas (right) plays an aging actor and acting coach in The Kominsky Method. Alan Arkin is his longtime agent. The "Sitcom King" is back with a series where both the situation and comedy are unexpected. Chuck Lorre, the mind behind huge hits that include Two and a Half Men, Mike & Molly, and The Big Bang Theory, has created a series for Netflix. It's set in Hollywood, but is really about the biggest show of all: growing old. 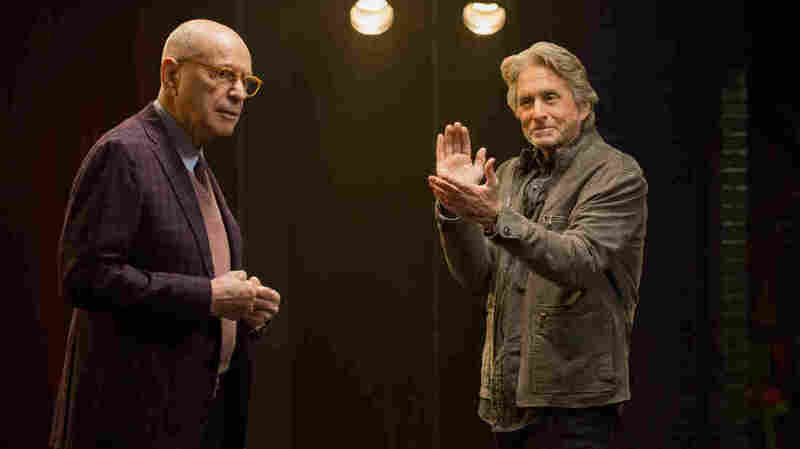 The Kominsky Method stars Michael Douglas as Sandy Kominsky, a matinee idol now in his 70s. He's an old star who now gets turned down for sitcoms, but keeps working as an acting teacher. Alan Arkin plays Norman, his friend and longtime agent. "There's a certain self-involvement in the [main] character that has to be overcome," Lorre says. "That's part of his journey. And the wife of his friend Norman, who is terminally ill, she has a big impact on him and opens him up to being close to mortality, to being close to the reality of getting older." Nancy Travis also stars, and the guests range from Ann-Margret to Jay Leno to Patti LaBelle to Danny DeVito. Lorre spoke to us about the show and the long career that has earned him the moniker "Sitcom King." "No, don't use that word," Lorre says. "Kings get their heads chopped off. Let's go with something else — court jester would be fine." 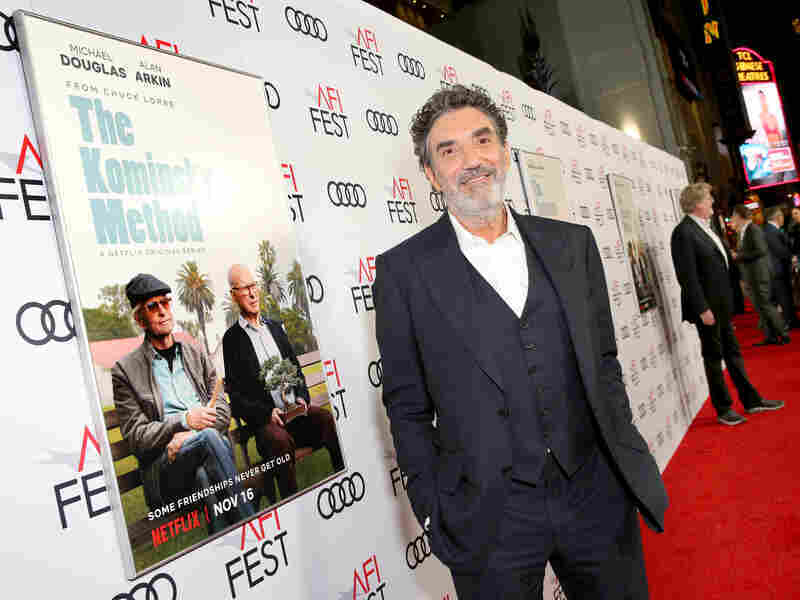 Chuck Lorre, pictured at the Los Angeles premiere of The Kominsky Method, has made a career of producing situational comedy in shows like Grace Under Fire, Dharma and Greg, Two and a Half Men and The Big Bang Theory. I wasn't really that interested in spoofing or doing a show about show business. What was interesting about this, in the world of Hollywood and acting, is: First and foremost, he's teaching a class of kids that are several generations removed from him, and that gulf between his perception of the world and a 22-year-old's perception of the world was something that was interesting to me. I wanted to write about that. And I also wanted to avoid the pitfall of making fun of acting, and have a character like Sandy Kominsky who is trying to imbue his love for the craft to the students. And some of the students, you see as you watch this thing, have real chops. They really can act. I think playing in front of a live audience every night — you have an obligation to a live audience. And the obligation in most bars is: The band is there to help the patrons dance — actually, believe it or not, to make them perspire so they'll drink more. ... And if the band doesn't do that, the band gets fired. ... "And we're going to do a little song in 7/4 that's impossible to dance to, but it's very interesting." Yeah no, they don't want it. They don't want that. "Sweet Home Alabama" will be fine, thank you. So when I started doing situation comedies in front of a live audience — and that's been, for the most part, all I've done for the last 30 years — there's that obligation to the audience. Now the obligation is not to cause them to dance, but to cause laughter. And once again it's not a bar owner this time; it's a network. If the audience isn't laughing, you're packing your belongings in a cardboard box and you're going home. But I think the more relevant part is: Playing music impacted on the way I listen to words. There's rhythm in dialogue; there's pauses like there's rests in music. There's pauses that make comedy possible. Everything plays almost musically, but with words. I remember the CBS president of children's programming said I just don't have the pony's voice. ... And I've got to tell you, I worked really hard on that. I was kind of devastated. I was going to take the Pony project and bring it up a notch. ... [But] I done OK. You know, that which doesn't kill us makes us bitter. One of the great advantages of doing this was: I had the freedom to just write and chase the characters where it felt appropriate to go. I guess I've been doing this long enough to where I reached a point where I just — I'm going to trust that this is appropriate, and do it, and not worry about what category it falls into. Sarah Handel and Alexander McCall produced and edited this interview for broadcast. Patrick Jarenwattananon adapted it for the Web.